Manage inventory in one place. Syncronise your motel inventory across multiple channels so you can maximise occupancy rates. Now you can put your rooms on even more sites. All for one low price. Ready to start your free 21 day trial? The UseROSS channel manager has a very simple pricing plan that doesn't change, no matter how many rooms or how many channels you use. We believe that things should be kept simple & that our service should always represent good old fashioned value. You don't need to worry, you will not be locked into any contracts. Simply pay month by month and you can stop whenever you like. Even if your UseROSS account is inactive, you can still reactivate it again whenever you wish. When you sign up for a UseROSS account everything is included. 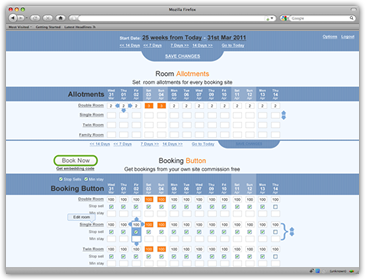 Our 'Book Now Button' makes it very easy to process bookings right from your website. The best thing is you wont have to pay any commissions which helps improve your bottom line. If you would you like to take her for a spin, then our free 3 week trial is for you. You will get full access to all our channel manager services. At any time during the trial period simply upgrade your UseROSS account to keep using our service. The UseROSS channel manager has been a great service to us, allowed us to find a lot of new channels to connect to and made managing our bookings and avoiding the dreaded double bookings a lot easier. But whats made them stand out has been their friendly and helpful service, always been happy to help us setup and answer questions and guide us. As for UseROSS channel manager, we cannot fault it. Our property was one of the set up properties and we were only on the Arra site and wotif. I don't know what our fear was for. This channel manager is so easy to understand and operate. We are now on quite a few of the available sites and growing the number. With that our turnover has also grown considerably. Thankyou.